The San Jose Sharks are down two games to none in the Stanley Cup Final, so it stands to reason that the game is afoot. On its face, that’s a pretty hefty accusation. Couture went on to explain his belief that Crosby “times them” and is subsequently not kicked out of the dot because of who he is. But on Friday, there was more clarity – if you can call it that. For the record, Crosby won 71 percent of his Game Two faceoffs and set up the overtime game-winner with an offensive zone faceoff win, sending Conor Sheary in for the goal. Couture’s initial comments have no greater design than to rattle the cage, than to suggest that something is not copacetic when it comes to Crosby and his knack for winning draws. “Cheating” is, as Couture rightly clarified, part of the game when it comes to faceoffs. The NHL rulebook says that each centre must line up with his feet between the markings, shoulders square to the opposing end of the rink, stick on the ice. The defensive player must position his stick first and the attacker must follow suit immediately. Players will typically move their feet or lean or lift sticks or whatever, all in an effort to gain an advantage when the linesman finally drops the bloody puck. If the official spots what he deems to be an unfair advantage, a player can be kicked out of the circle. Too true. 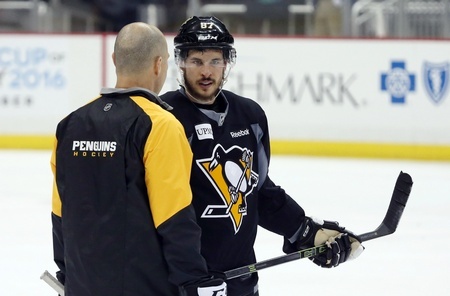 What’s also true is that Crosby limits his extracurricular efforts because he can’t afford to get kicked out. Passing the draw off to Patric Hornqvist or Conor Sheary is not advisable. While Couture walked back his comments about Crosby’s “cheating,” the point remains the same and the Sharks are trying to gain any advantage right now. The problem is that the games within the game aren’t working. San Jose has to be better if they want to challenge for the Cup and all this talk of unfair advantages won’t amount to a thing if they can’t put together a win.